Garage door springs are often the first parts of the system to break, due to the enormous amount of stress they go through on a daily basis. Once these components break, it will be either very hard or impossible to open the door. In fact, even trying to move it will put you at risk, and may even damage other load-bearing parts in the process. There are two different varieties of garage door springs. The first type comes in pairs, with each unit installed on one side of the door. These are called extension springs, and they work by stretching while the door closes and then contracting to help it rise back up. Because of this, they are more dangerous and more likely to whip around when they break, which is why they are often attached with safety cables that are meant to keep them in place if that happens. The second type is the torsion springs, that operate using torque. Usually, only a single unit is required, as springs of this type are often very durable and flexible. They are installed above the door, horizontally, and transfer their stored tension to drums that wind and unwind cables in order to lift and lower the door. In most cases, a spring will break after the door has already closed. However, in some situations, this can occur while the door is in motion, at which point it will probably slam shut unexpectedly. It's easy to tell If your garage door spring broke, as you will undoubtedly hear a loud bang, which is the result of the sudden release of tension. Make sure to keep your distance from the door and contact our team as soon as possible. 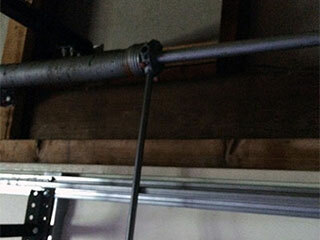 Garage door springs can be incredibly dangerous, especially before they break. However, even afterwards, dealing with these components should only be performed by expert technicians, as there could be more underlying issues and you probably won't have the experience required to handle them. Our technicians specialize in performing spring replacement and adjustment, so you can count on us to take care of things both quickly and safely. Call Garage Door Repair Casselberry today if you need some help with these important yet dangerous components.